India is a country of multiple cultures, states, languages. Our motto is Unity in Diversity. There are so many common factors which help in establishing this thought. Of all according to my opinion Golgappa is one snack favorite of all. In Bengal it’s called Phuchka, Mumbai as Pani puri, Bihar as Phulki, North India calls is Golgappa. It’s the king of all snacks in India. The snack originated from the Magadha region of India present day Bihar. The most important quality of good pani puri is it should be crispy. Generally two types of water are famous one sour (khatta paani) and sweet (meetha paani). Both types are spicy. Sour water is prepared by using mint leaves, coriander, tamarind pulp, Jaljeera, chili powder and other requisite spices. Sweet with same ingredients but sugar, jiggery is added as sweetener. I am fan of sweet water. Bread of golgappa could be prepared by Suji (semolina) or wheat flour. In north India mostly prefers semolina one. In cities like Hyderabad, Mysore, Banglore it’s difficult to find one made with Suji. All they eat is wheat flour bread. It’s source of employment to lot of individuals. Now a days even five star hotels are also trying to improve taste of pani puri. My worst experience of Pani puri was at of the famous hotel of Delhi. At that time I vowed to myself to never eat Pani puri at any five star. 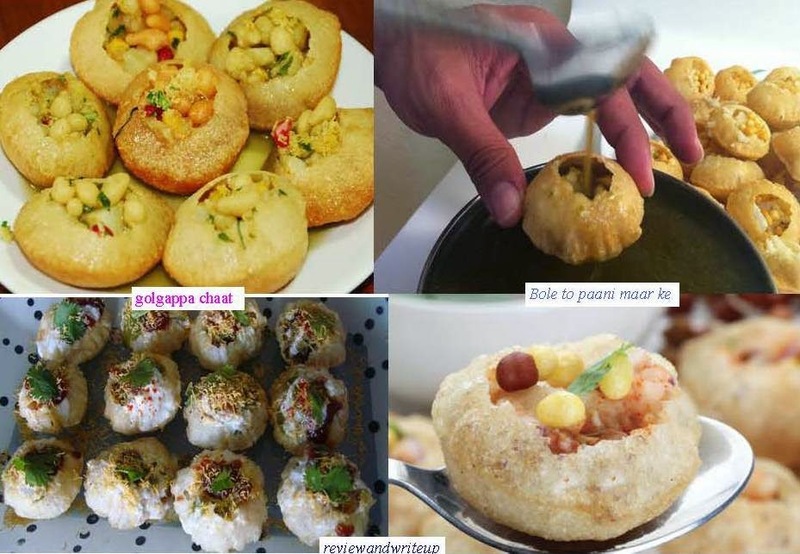 Why not to miss golgappa? It’s one of the snacks which don’t put on weight. Girls you can eat as many as you want. The water is digestive. No dietician is ever going to stop you from eating the snack. If someone do so, change the dietician. You are depressed go and have some pani puri. Trust me it acts as the best stress buster. It’s not only the taste that will make you happy, but I guess the process of eating it makes it interesting. You have to make sure that you eat it in one go. Everyone around is eating without bothering how they look with their mouthful with the snack. It’s a myth that girls are chatori. I have seen that guys eat more pani puri than girls do. I remember going to market sometimes for minor jobs for the sake of eating pani puri. Making chaat is another way of eating it. My mom prepares amazing golgappa chaat. Golgappa have always been topic of interest of film makers. Remember famous scene of Rab Ne Bana Di Jodi where Shahrukh and Anushka have pani puri eating competition. An epic scene from movie Amar Prem where Omprakash eat phuchka with alcohol instead of regular water. Another funny scene is from latest movie Queen where an Italian chef challenges Kangana to prepare an Indian Snack. She prepares golgappa and keeps on display. One foreigner couple comes and eats it. The old man curses her because water was spicy and leaves only returning a minute later that this is the best thing he has ever had. While I was studying in Delhi, I and my few friends used to eat pani puri every single day. We used to skip our dinners and had golgappa. Any tourist visiting India try the snack. You won't regret it. My mouth is watering, and I am going to have golgappa in the evening today. What about you?